CityView Properties commissioned the Urban Design Project at the University at Buffalo’s School of Architecture and Planning, working with Kevin Connors & Associates, to assist the company in developing a strategic plan for the area in the City of Buffalo centered at Exchange and Van Rensselaer Streets, the site of its highly successful Larkin at Exchange commercial redevelopment project. CityView Properties sought recommendations for potential future projects that would help it to best capitalize on its past and ongoing investments in the District, as well as take advantage of the existing assets of the area and the opportunities they create. 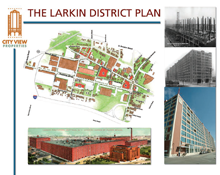 These overriding goals created the framework for the specific objectives, ideas, and concepts detailed in this plan regarding proposed potential investment and redevelopment activities in the Larkin District. 1. Market the Larkin District “brand name” so that it becomes recognizable and identified with by the public. 2. Base the “image” of the district on its past and help brand the District with future design features. 3. Allow for flexibility and change in the Plan. 4. Whenever possible, preserve, restore and/or reuse important historic features. 5. Blend new features with old to enhance the appeal of both. This does not mean imitating the architectural features of historic buildings. 6. Capitalize on the proximity of the Larkin District to downtown through physical connections and visual design features. 7. Improve physical, visual, and way finding connections between the Larkin District, its businesses, and its residents and the region. 8. Encourage a vital urban neighborhood by developing vibrant streets and public spaces. 9. Make the district safe and easy to get around for all people using different modes of transportation—pedestrians, bicyclists, transit riders, car drivers, and truck operators alike.